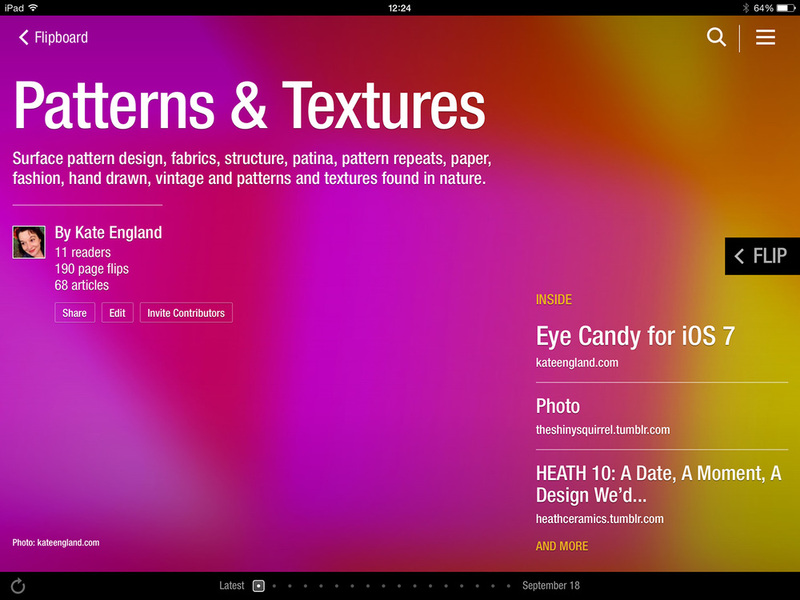 Lately I've been experimenting with making magazines on Flipboard, as a compliment to curating with Pinterest. I've got a few different themes on the go, one of them is Patterns where I share surface pattern design, fabrics, structure, textures, embroidery, patina, stitching, rust, pattern repeats, floral, paper products, fashion, textiles, hand drawn, vintage, wallpapers, websites, geometric, argyle, tips, techniques and patterns and textures found in nature. Take a look at my Pinterest board for Patterns and Textures as well as my new magazine Patterns & Textures on Flipboard. Updated December 16th with a new Flipboard magazine that replaces this one.